Image from article, with caption: Left to right: Goh Jia Shin, Chia Hia Shin, Norhayatun Najibah binti Kifli, Dr Lim Tion Hoo, Jacqueline Liew and US Embassy BSB Public Affairs Officer Catherine Muller during the panel discussion. 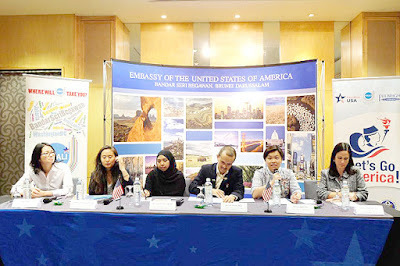 BRUNEIAN alumni of the United States’ international exchange programmes yesterday convened at the Radisson Hotel in the capital on how to further engage with the local community on different causes, while also sharing stories with other alumni of various programmes offered by the US Government. The Alumni Conference and Networking Reception, held as part of the US Embassy’s ‘Let’s Go America!’ event, featured a panel discussion from some of the most recent participants of the US Department of State’s sponsored exchange programmes, covering a variety of education, cultural and professional fields. Now in its fourth year, ‘Let’s Go America!’ is an annual public diplomacy initiative organised by the US Embassy in Brunei Darussalam, to showcase education opportunities, travel information, cultural exhibitions, and information on doing business in the US. 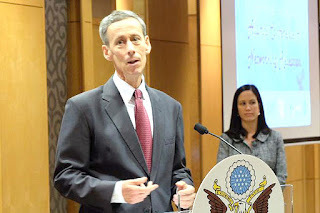 The US Ambassador to Brunei Darussalam, Craig Allen, said in his welcoming remarks that the alumni of US exchange programmes represent an important and direct connection between the US and Brunei, which will strengthen relations for many years to come. “A strong alumni network is the best foundation for positive relations between countries though sustained personal contact,” he said. The ambassador also spoke of the multitude of opportunities for networking in either their personal and professional capacities, both during and after the exchange programmes. “Every year, alumni from Brunei build on what they learned on their programmes, and upon their return to Brunei, they work with the community, strengthen people-to-people relations, and empower the next generation of leaders,” he said. During the panel discussion attended by around 85 alumni, guests had the opportunity to hear stories from former participants of premier exchange programmes offered by the US Department of State through its Bureau of Educational and Cultural Affairs such as the Fulbright US Student Programme, the International Visitors’ Leadership Programme (IVLP), the South East Asia Youth Leadership Programme (SEAYLP) and the Young Southeast Asian Leaders Initiative (YSEALI). Jacqueline Liew, an alumnus of the Fulbright US Student Programme in 2013, shared some of the experiences in overcoming challenges and introducing change in the creative industry in Brunei; while Dr Lim Tiong Hoo, a Fulbright US-Asean Visiting Scholar Programme alumnus from 2015, shared some of his major takeaways from the programme and how it inspired his research work in Brunei as a lecturer at Universiti Teknologi Brunei (UTB). Chia Jia Shin, an IVLP alumnus who recently attended a professional exchange programme on Social Entrepreneurship, also shared the positive impact of her three-week experience through the opportunities she gained through working with people from other countries with common goals. Goh Chai Li, an alumnus for YSEALI Professional Fellow 2017 of the INITIATE start-up workshop and a lecturer at Politeknik Brunei, also spoke of the skill sets that she gained in the US which were successfully implemented in post-programme projects and continuous engagement. YSEALI Professional Fellow 2017 Norhayatun Najibah binti Kifli, who founded Youth against Slavery Brunei (YASBrunei), was also on the panel, sharing her advocacy work, which is the country’s first-ever civil society organisation focused on countering Trafficking in Persons. Over the years, the US Embassy has nominated and sent many outstanding Bruneians to the United States and around the world, to participate in selected programmes that reflect the participants’ individual or professional interests. The programmes are also designed to increase mutual understanding by means of educational and cultural exchanges that assist in the development of peaceful relations, along with the foreign policy goals of the US Government. U.S. President Donald Trump will travel to Japan, South Korea, China, Vietnam, and the Philippines on Nov. 3-14 amid an increasingly tense standoff over North Korea's nuclear weapons, as Beijing ordered all North Korean-owned businesses within its borders to close by early January. "The president's engagements will strengthen the international resolve to confront the North Korean threat and ensure the complete, verifiable, and irreversible denuclearization of the Korean Peninsula," the White House said in a statement on Friday. Trump will attend regional summits and discuss trade and the North Korean nuclear threat. The announcement comes as Secretary of State Rex Tillerson prepares for a second trip to China, as Trump and North Korean supreme leader Kim Jong Un trade increasingly hostile rhetoric. China has ordered all North Korean-owned businesses in China to close by January, in a bid to shut off foreign revenue streams for Pyongyang under United Nations sanctions imposed over its nuclear and missile programs. Companies, including joint ventures with Chinese firms, have 120 days to close from Sept. 11, the date the U.N. resolution was adopted, China's commerce ministry said on Thursday, in a move which will likely affect around 100 restaurants run by North Koreans, a quarter of which are located in Beijing. Meanwhile, Tillerson will meet with his counterpart Wang Yi and other Chinese leaders on Saturday, where he will call on the ruling Chinese Communist Party to take further steps on limiting crucial oil supplies to North Korea, as well as pressing for the full implementation of existing United Nations sanctions. "The major tasks of his visit to China are exchange of in-depth views on ways to strengthen China-U.S. relations, in particular President Donald Trump's state visit to China ... and on major international and regional issues of common concern," foreign ministry spokesman Lu Kang told a regular news conference in Beijing. "If there is further information we will provide it in a timely fashion," he said. U.S. officials say that if restrictions on trade in textiles, coal and other commodities are properly enforced, North Korea will lose the vast majority of its export revenue. China accounts for about 90 percent of North Korea's foreign trade, and Washington sees it as pivotal to putting pressure on Pyongyang to disarm. U.S. officials have lauded recent measures by Beijing, while Trump recently said that China had ordered its banks to stop dealing with North Korea, although no public announcement has been made. Chinese analysts, whose thinking often informs and reflects policy in Beijing, are skeptical, however, while officials have repeatedly called for a return to the negotiating table and a diplomatic solution to the crisis. Wu Fei, senior fellow at the Chinese public diplomacy and international relations think tank Chahar Institute, said there may be limits to the pressure such sanctions can exert on North Korea. "They have no industrial products to speak of, and their harvest is pretty much gathered in now," Wu said. "Their demand for basic resources will be pretty low for the next six months or so." "They don't rely on the outside world for much, and that includes China. North Korea wants to show the rest of the world how independent it is; this is the impression they want to create," he said. "I reckon they can hold out for another six months or so." However, Chinese journalist Xu Xiang said public opinion in China is swinging firmly against its isolated Stalinist neighbor. "This policy of opposing the U.S. and supporting North Korea: What have we gotten in return for the blood spilled by our fathers' generation [in the 1950-1953 Korean War]?" Xu said. "All it's done is turn the Kim dynasty into even worse bandits than they were before." "As Chinese citizens, we feel pretty unsafe," he said. But Xu added that China doesn't believe it has the key to the North Korean nuclear crisis. "The only country that can solve this is the United States, and only military force is going to sort this out properly," he said. U.S.-based retired Toledo University professor Ran Bogong said the ruling Chinese Communist Party is still hoping to force some concessions out of Pyongyang, however. "China is hoping now to force Kim Jong Un into making some kind of compromise vis-à-vis the U.S.," Ran said. "The U.S. and China need to work closely to ensure that when Trump visits, there is some kind of definite result." "Neither Beijing nor Washington wants to see the North Korean issue create further conflict between them." Reported by Lin Ping and Yang Fan for RFA's Mandarin Service, and by the Cantonese Service. Translated and edited by Luisetta Mudie. China’s Image Campaign: Green on the Outside, Black on the Inside? “Green mountains and clear water are as good as mountains of gold and silver,” said Chinese President Xi Jinping as he underscored his country’s commitment to becoming an “ecological civilization” at the 2016 UN climate change conference in Marrakech. Fine words. But should we believe them? After years of being known as one of the dirtiest countries on the planet, China is now making a concerted effort to re-brand itself as a proponent of green energy. This forms part of a wider, multi-channel effort to boost its global soft power that encompasses everything from building new language institutes to trying to head major UN bodies. However, whether this is a legitimate strategy or just good PR is a question Beijing still struggles to answer convincingly. Undoubtedly, China is making some positive changes. The country has been catching up with its counterparts by planning new national parks. Aimed at protecting areas of outstanding beauty and preventing environmental damage from construction, mining, and pollution, the parks are due to open in 2020. This is also the deadline China has set for ploughing $361 billioninto renewable power sources. The Chinese government hopes that in just three years, these sources will account for half of new electricity generation in the country. So far, so good. But scratch beneath the surface, and there are indications “Green China” is actually just a veneer disguising a less palatable reality. China is still the world’s largest producer of “black” aluminum. In 2016, coal still powered 88% of production. Pollutants released by aluminum production and other shady practices are among the many reasons that China’s inland waters are so befouled. According to Greenpeace China, 80% of shallow ground water wells are polluted. Continuing with the aquatic theme, China – having depleted its own marine stock through unsustainable fishing methods, like trawling – is taking steps to improve its fishing stock through a summer moratorium on fishing in the South China Sea. While they allow their own marine life to recover, Chinese fishermen are now marauding through foreign waters, exploiting the coasts of some of the poorest countries in Africa. These environmental projects – many of them undertaken for appearance’s sake – are a main component of China’s global soft power campaign, which encompasses the environment but also the arts, culture, literature, and more. The campaign started a decade ago, when the Communist Party declared a new objective to invest in its soft power as a complement to its rapidly growing economic and geopolitical clout. It’s estimated Beijing spends some $10 billion per year on the campaign, one of the most generous state-sponsored public diplomacy projects in the world. That money has been building quite a few new cultural centers. Many of China’s investments in global prestige are aimed at boosting China’s presence – and its influence – within key multilateral institutions. One major opportunity to do so will take place at UNESCO over the next several weeks, where the Chinese government has been pushing for its candidate, Qian Tang, to become the next director general. For a country that has previously shown open disdain for the UN and its core norms – not least environmental protection and human rights – this indeed seems to be a sea change. However, just as with many of China’s new “green” projects, Tang’s campaign is simply another component of Beijing’s drive to boost its international standing. When it comes to UNESCO, China has become adept at using the organization to its own advantage, having secured 52 World Heritage-ranked sites that stand to earn millions, if not billions, in new tourist revenues. Given all this, the organization needs to select its next leader with caution. Unfortunately, there’s little sign Tang would be the right person to oversee an agency with so many flagship environmental and scientific programs, let alone the one to mend its internal divisions. And most of the other candidates are hardly better. France’s candidate, Audrey Azoulay, has been accused of demonstrating overtly pro-Israel bias, raising questions about her ability to help the organization rise above its current impasse. Qatar’s horse in the race, Hamad bin Abdulaziz Al-Kawari, has been accused of endorsing anti-Semitic works by the Simon Wiesenthal Centre and would be arguably worse. Perhaps the only candidate that enjoys positive relations with both Israel and the Arab world – and could bridge the current divide – is Moushira Khattab, who can point to extensive experience as a diplomat and as Egypt’s representative at UN headquarters in New York as well as the United Nations Industrial Development Organization (UNIDO) in Vienna. Her candidacy leans on a track record of pushing progressive reforms in defense of women’s rights in Egypt; Khattab has, for example, been a leading advocate against the practice of female genital mutilation (FGM). Given the challenges UNESCO currently faces to its core missions in the Arab world, a candidate from the region could speak and act with greater inherent legitimacy – but that will not alter China’s incentives to pursue Tang’s candidacy. None of this is to say that China’s soft power campaign is entirely self-serving. Numerous aspects of its environmental program and its support for Chinese language programs are undeniably positive. Yet China still has a ways to go. Given UNESCO’s own internal difficulties, allowing Beijing to lead the organization would be a bridge too far. 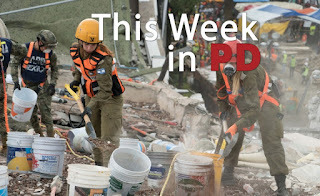 This week’s PD News focused on nations, organizations, and celebrities helping people in need. After the 7.1 earthquake in Mexico, IsraAID sent humanitarian relief to the rural surroundings of Mexico City. 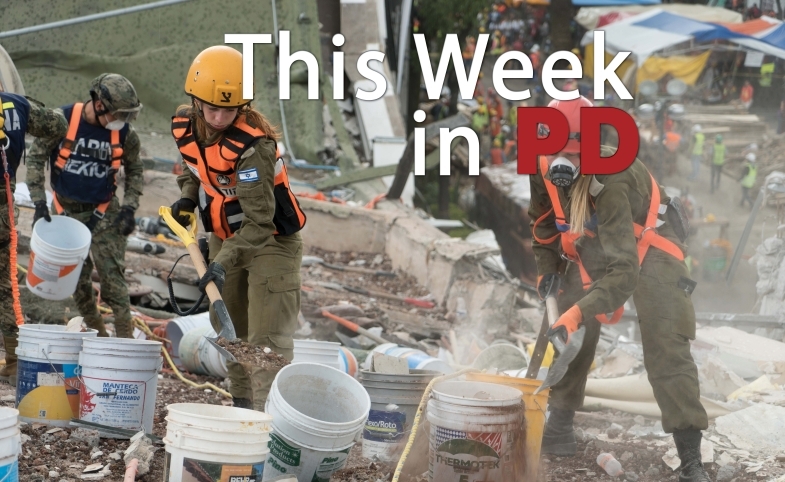 Meanwhile, Hurricane relief in Texas and the Caribbean continued. Pitbull loaned his private jet for Puerto Rican aid, and the Burning Man festival donated remaining bicycles to the affected areas. Additionally, aid organizations lobbied the Myanmar government for access to people in Rakhine State. Image from article, with caption: The UN headquarters in New York, lit up with the symbols of the SDGs and the flags of the member states. Interestingly, changing political winds, not just in the United States but also in Europe, offer opportunities for a public/private meeting of minds. 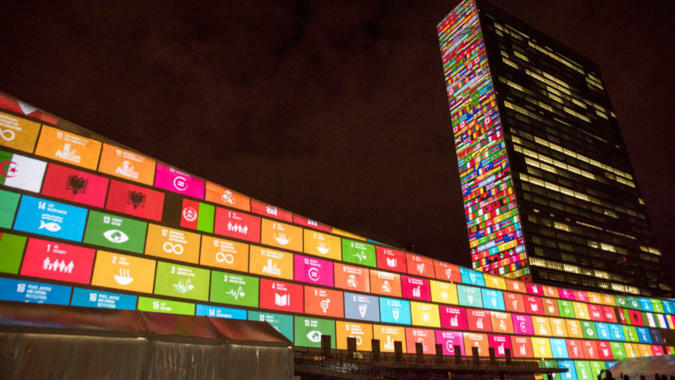 In the present ‘post-fact’ era, the very idea of SDGs and international co-operation is itself challenged by populist movements. Corporate narratives can complement EU and member states’ public diplomacy. It helps when companies explain complex sustainability issues to the public. It enhances the legitimacy of experts when leading business people are forthright in speaking out against the politically-motivated dismissal of facts that are presented as inconvenient opinions of the elites. A recent development is that we see CEOs raising their voice in support of sound arguments and against populist policies which damage business, such as ‘SDG advocates’ Paul Polman (Unilever) in Europe and Jack Ma (Alibaba Group) in Asia. No longer unlikely bedfellows, business people and civil servants are becoming more closely connected. Conan and ‘Transparent’ give Israel the normalcy it craves. 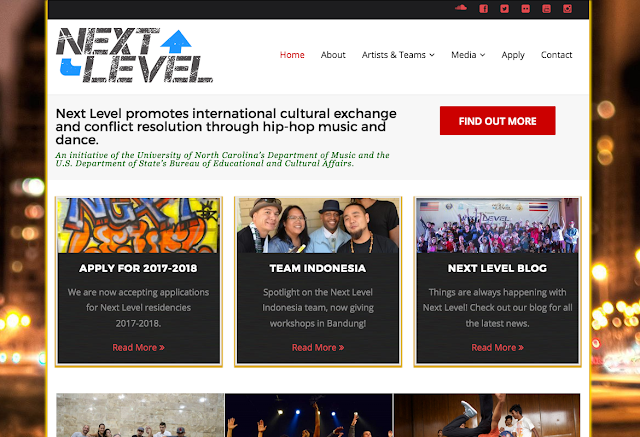 This summer, the Meridian International Center partnered with the State Department’s Bureau of Educational and Cultural Affairs and the University of North Carolina at Chapel Hill (UNC) to produce Next Level [see], an exchange program showcasing hip-hop music and dance to international audiences in underserved communities. Drawing on its high-tech prowess and unprecedented social media opportunities, Israeli Prime Minister Benjamin Netanyahu’s office has strongly embraced new media channels to reach millions of viewers directly, including in the Arab world. “Israeli officials are now regularly interviewed on main Arab TV channels and Israeli pundits offer there their insights,” he said, adding that Israel is also active on social media in Arabic. With the aid of Arabic language spokespeople in the Prime Minister’s Office, the Foreign Ministry, and the IDF, there are millions of followers on the Arabic Facebook and Twitter accounts. Yet, despite these efforts, years of anti-Semitic and anti-Israel messaging by Arab governments are sometimes difficult to overcome. Netanyahu, speaking at an event earlier this month hosted by the Israeli Foreign Ministry, noted the current shift in Arab sentiment towards Israel is more profound today than the improved relations seen following the 1993 Oslo Accords with the Palestinians and the 1994 Israeli peace treaty with Jordan. Despite the positive trend, many of Israel’s Arab neighbors have yet to engage in direct relations with the Jewish state. Further, the prime minister chided the Palestinians for not following the regional trend of rapprochement with Israel. Gendelman is also active on social media, his twitter account, which posts in Arabic and English, has over 46,000 followers. “Hostility towards Israel is still widespread in the Arab world but Israeli public diplomacy in Arabic can give the Arab digital generation the truth about Israel and its people,” he added. 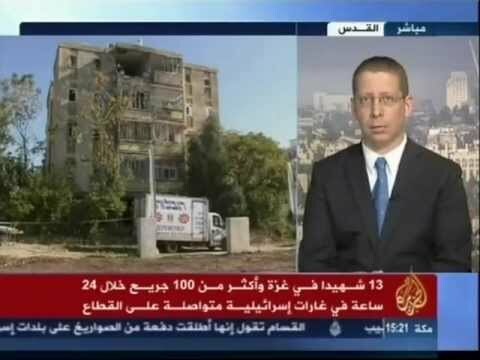 How should Israel carry out an effective Arab PR strategy? The Israeli government needs to look at the big picture and take a comprehensive approach to anti-Israel and anti-Semitic sentiment in the Sunni Arab world, said Ariel Cohen, a senior fellow at the Atlantic Council think tank and director of the Center for Energy, Natural Resources and Geopolitics at the Institute for Analysis of Global Security in Washington. 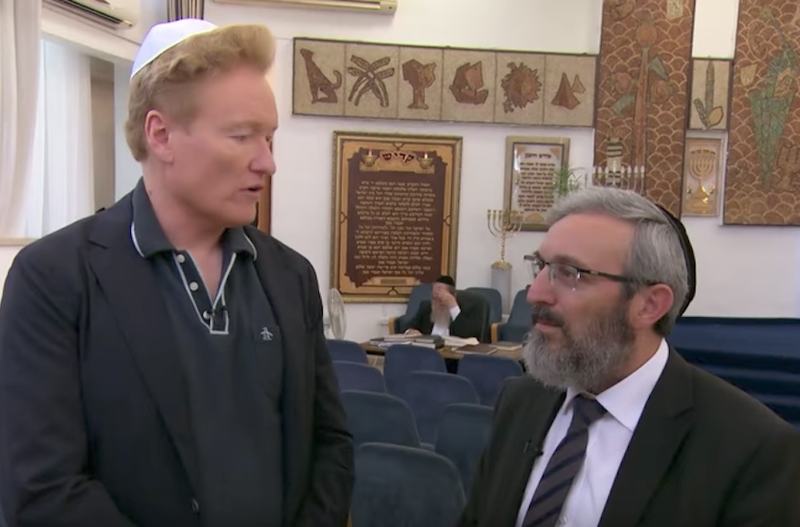 “Israel has not developed an effective hasbara (public relations in Hebrew) strategy regarding anti-Israel and anti-Semitic attitudes both in the Arab world and in the West,” asserted Cohen, who has over 25 years of experience in strategic communications. “It is absolutely vital to identify credible opinion leaders and work with them incessantly and systematically to promote a positive and friendly image of Israel for the Arab elites and the street,” he added. Social media and traditional media are particularly important in that regard, and more openings exist, as central controls of the 20th century state-run propaganda are getting weaker, he explained. “Strategically deepening, legalizing, and formalizing relationships with the Sunni states, and not allowing them to keeping relations ‘in the closet’ is extremely important for the legitimacy and long-term survival of Israel in the Middle East,” Cohen said.